Wood is convenient, as is the official slogan of the "Legno & Edilizia" fair, which returns to color the pavilions of the Verona Fair with innovative proposals and ecological solutions. The event opens to the public from Thursday 7 to Sunday 10 February, with the aim of telling the evolution of the use of wood in construction, towards an increasingly sustainable future and housing solutions closer to man and the environment. 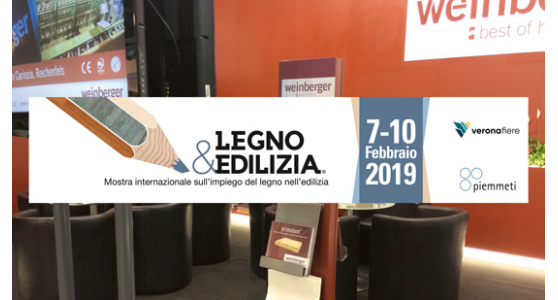 Legno & Edilizia has reached its 11th edition and inaugurates with a novelty, which has already been discussed for some months. This is EcoHouse, an event in the event, which includes a wide range of proposals. Therefore, showcasing materials and technologies for sustainability and energy saving in buildings: renewable energy, environmental comfort, home automation services, everything concerning the evolution of eco-sustainable building. The fair is aimed at professionals and technicians in the sector, but not only, with free entry opens up to a much wider audience, including those interested in the welfare of our planet, eco-friendly cities and those who choose a quality more sustainable life, starting from homes. The fair focuses on wood, as a primary resource for building intelligently. Using wood in construction means incorporating a totally natural, long-lasting material into building habits that guarantees comfort, safety, sustainability and even economic benefits. Legno & Edilizia provides construction professionals with new techniques, spaces and conventions for updating, meetings with experts, so that new skills can be developed and a wood-focused building business can be developed. The conferences will include information and training areas that will address the development of the 4.0 industry, ie how the work habits in construction will change with the introduction of increasingly robotic systems and artificial intelligence. In the last edition 200 companies joined the exhibition and 30,000 professional visitors were registered.